Adam Wainwright allowed two runs on three hits over six innings in the Cardinals' 5-2 loss to the Reds on Saturday. He walked two and struck out four while falling to 1-1. Wainwright served up a pair of solo home runs in this one, both to left-handed batters. Lefties have given him trouble over the past few years, as have righties, because Wainwright has been downright horrible over the last three seasons. He owns a 4.73 ERA and 2.4 K/BB ratio since 2016. He's shown a little upside with his curveball at times, but it comes inconsistently and the bad tends to outweigh the good with Wainwright at this point. His next start comes Friday against the Mets. Adam Wainwright allowed one run on five hits over six innings in the Cardinals' 4-1 win over the Padres on Sunday. He walked zero and struck out nine while improving to 1-0. Wainwright turned back the clock in this one, as he had San Diego batters flailing at his signature cutter and curveball all throughout the game. There is still a lot to dislike in this profile, but Wainwright may be usable in favorable matchups. His next start comes Saturday against the Reds in Cincinnati. Adam Wainwright allowed four runs on four hits over four innings in the Cardinals' 6-5 win over the Pirates on Monday. He walked four and struck out three. Wainwright was not sharp in this one, as he struggled to locate with his curveball from the beginning. The 37-year-old posted a 4.46 ERA and 4.34 SIERA last season, and is no longer a viable fantasy option in mixed leagues. Adam Wainwright allowed two earned runs in three innings in the Cardinals' 9-5 spring loss to the Tigers. He gave up five hits and one walk while striking out three. Three of the five hits Wainwright surrendered went for extra bases, including a home run to Mikie Mahtook. 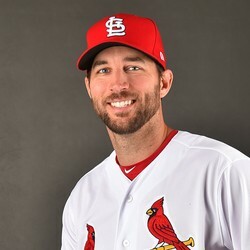 Wainwright is coming off another dismal season, posting a 4.46 ERA and 2.22 K/BB ratio in 2018. The 37-year-old is all-but cooked as a major league starter, and has no fantasy value outside of deep NL-only formats. Adam Wainwright struck out one in his two perfect innings on Tuesday versus Washington. Wainwright has been promised a rotation spot this year despite his recent history of lackluster results. Fantasy players should look elsewhere when selecting starting pitchers late in drafts.